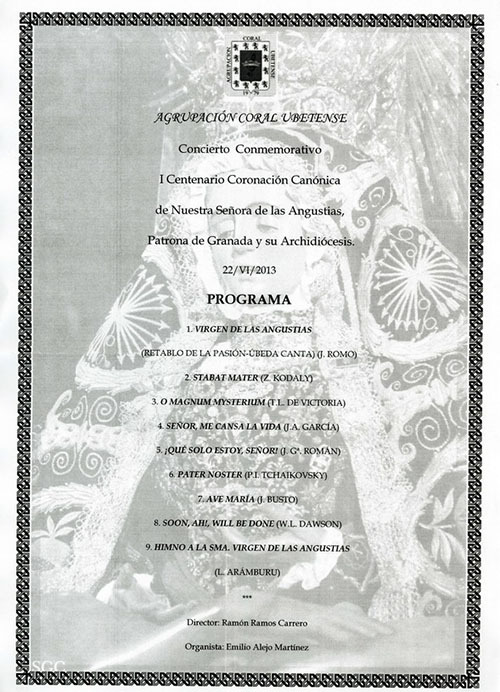 CONCIERTO DE LA AGRUPACIÓN CORAL UBETENSE DE ÚBEDA – JAÉN, DENTRO DE LOS ACTOS CULTURALES PROGRAMADOS CON MOTIVO DEL AÑO JUBILAR MARIANO DEL PRIMER CENTENARIO DE LA CORONACIÓN CANÓNICA DE LA STMA. VIRGEN DE LAS ANGUSTIAS DE GRANADA, EN SU BASÍLICA. 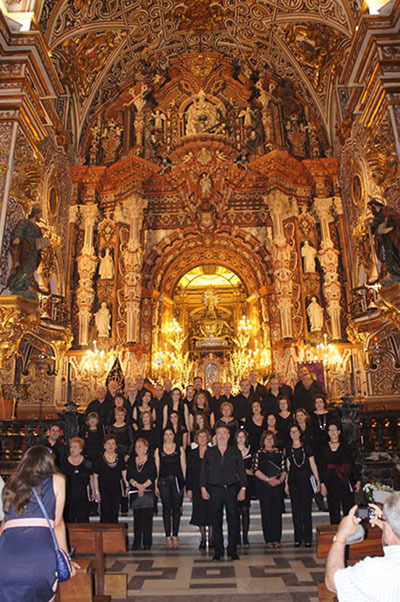 EN LA TARDE DE AYER, SÁBADO, DÍA 22 DE JUNIO DE 2013, HA TENIDO LUGAR EL CONCIERTO DE LA AGRUPACIÓN CORAL UBETENSE DE ÚBEDA – JAEN EN EL MARCO INCOMPARABLE DE LA BASÍLICA DE LA VIRGEN DE LAS ANGUSTIAS, DENTRO DE LA PROGRAMACIÓN DE ACTOS CULTURALES DEL AÑO JUBILAR DEL PRIMER CENTENARIO DE LA CORONACIÓN CANÓNICA DE LA STMA. VIRGEN DE LAS ANGUSTIAS DE GRANADA. 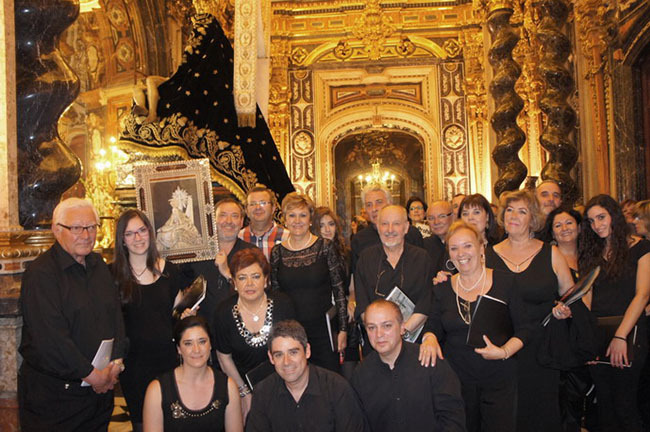 EL CONCIERTO HA COMENZADO CON LA INTERPRETACIÓN DE LA OBRA VIRGEN DE LAS ANGUSTIAS DEL RETABLO DE LA PASIÓN – UBEDA DEL MAESTRO J. ROMO. EL PROGRAMA COMPETO FIGURA AL PIE DE ESTA CRÓNICA. 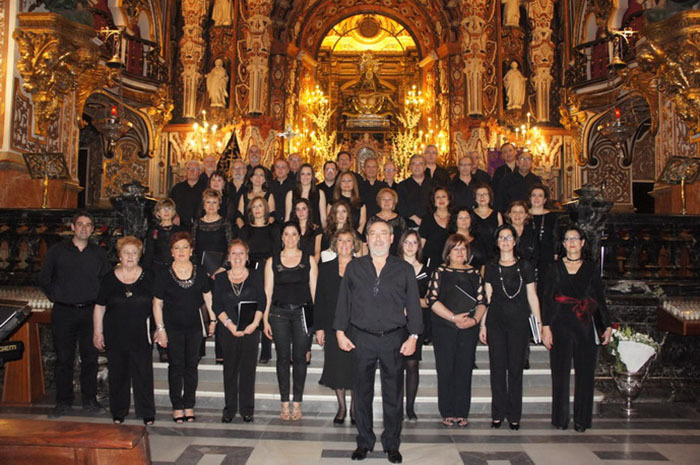 AL TERMINAR EL CONCIERTO TODOS LOS INTEGRANTES DEL MISMO SE HICIERON UNA FOTO EN LA ESCALINATA DEL ALTAR MAYOR Y ANTE LA INSISTENCIA DE TODAS LAS PERSONAS ASISTENTES HAN TENIDO QUE INTERPRETAR OTRA CANCIÓN: “SIGNORE DELLE CIME” COMO BROCHE FINAL DEL MISMO. SEGUIDAMENTE PASARON AL CAMARÍN DONDE D. ANTONIO MEZCUA, LES EXPLICÓ BREVEMENTE EL S¡GNIFICADO Y LOS VALORES ARTÍSTICOS DEL MISMO. EN NOMBRE DE LA PARROQUIA Y DE LA HERMANDAD DE LA VIRGEN DE LAS ANGUSTIAS, LES AGRADECIÓ, SU PARTICIPACIÓN EN ESTE AÑO SANTO JUBILAR, ENTREGÁNDOLES UN CUADRO DE LA VIRGEN DE LAS ANGUSTIAS, QUE TODOS AGRADECIERON CON UN GRAN APLAUSO A LA STMA. VIRGEN Y CON EL REZO DEL AVE MARÍA TERMINO LA VISITA AL CAMARÍN. 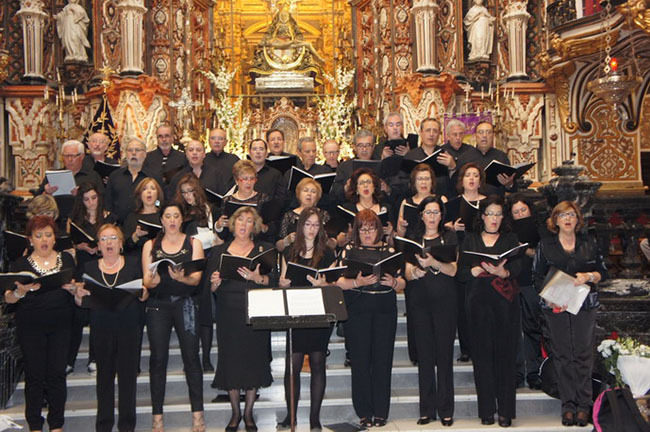 TODAS LAS PERSONAS INTEGRANTES DEL CORO, ASÍ COMO SUS ACOMPAÑANTES MANIFESTARON SU ALEGRÍA Y REGOCIJO POR HABER TENIDO EL HONOR DE CANTAR EN LA BASÍLICA EN ESTE AÑO JUBILAR, DE HABER PODIDO DISFRUTAR DE LA PRESENCIA CERCANA DE LA STMA. 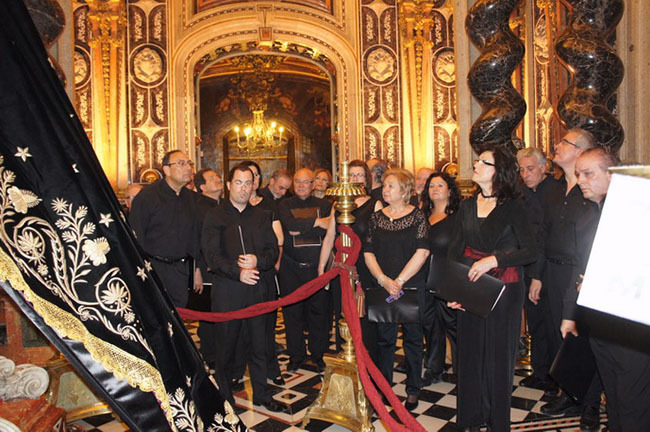 VIRGEN Y POR TODAS LAS ATENCIONES RECIBIDAS TANTO POR PARTE DE LA BASÍLICA CON SU PÁRROCO, D. FRANCISCO MOLINA Y DE LOS MIEMBROS DE LA HERMANDAD, QUE EN TODO MOMENTO ESTUVIERON MUY PENDIENTES DE TODA LA ORGANIZACIÓN DEL CONCIERTO. MAGNÍFICO COMENTARO Y MAGNÍFICAS FOTOS, AMIGO ANTONIO. MUCHAS GRACIAS EN NOMBRE DE TODA LA CORAL.